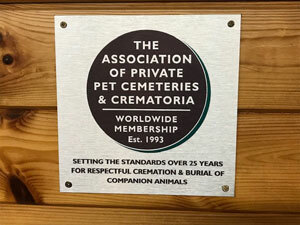 This year we are celebrating the 25th anniversary for The Association of Private Pet Cemeteries and Crematoria. Chestnut Lodge Pet Crematorium and Pet Cemetery were Founder Members of the Association and have always worked hard to uphold the strict Code of Practice and the ethics that go with it. We recently had a celebration at Shrigley Hall, near Manchester, which was attended by many pet crematoriums around the country as well as exhibitors of pet funeral products. A combination of work and play, it was a great weekend with a lot of useful tips which will go towards helping our clients. Our celebration plaque is now displayed in our reception office. Go to https://appcc.org.uk/25th-anniversary-celebrations to see a full report with pictures of the event. We are fully committed to working with the APPCC and promoting its ethics. It is truly the only Code that safeguards the pet owners and, with compulsory inspections being introduced (we have already been inspected voluntarily), it brings a professional approach to a sector that has so often been tarnished with corruption. Please refer any friends or relatives who have lost their pets to find their nearest member on the APPCC website. It really does make a difference and you will be supporting businesses that work locally and really care about their clients. This is especially important as so many clients who used to use us through their vets are being diverted to large, nationwide organisations through the acquisition of veterinary practices by large corporations. Usually, the services are not the same but are rarely described to bereaved pet owners who may have little knowledge of where their pets go.